Discount Wine Racks and accessories. Free shipping on all selections in this category. This wine cabinet features a burnished brass metal accents, and a burnished bronze bar pull with a handsome Rustic Hardwood finish on select hardwoods and veneers. It also features a decorative mirror, a metal stemware rack holds 15 large wine glasses and upper shelf for more glassware storage. 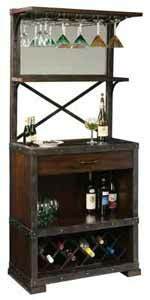 Size : H 73.75", W 33.25", D 16.75"
The Wine Butler wrought iron and wood floor standing wine rack offers a removable serving tray. The wrought iron metal wine rack is finished in warm gray and the wooden serving tray in Americana Cherry. Wine rack holds up to 21 bottles. Some assembly required. Adjustable levelers under each corner provide stability on uneven and carpeted floors. Free Shipping. Size: H. 36" W. 15-1/2" D. 11"